American chemist and physicist Robert S. Mulliken used quantum mechanics to help explain the behavior of electron orbits as atoms merge to become molecules. His father taught organic chemistry at the Massachusetts Institute of Technology, and he studied under Robert A. Millikan at the University of Chicago. Friends and colleagues called him "Mr. Molecule", and for his research on chemical bonds and unraveling the electronic structure of molecules, he won the 1966 Nobel Prize for Chemistry. Beginning in 1922 he pioneered isotope separation by evaporative centrifuging. In 1925 he proposed that there are two types of multiplicity in the band spectra of diatomic molecules. In 1927, with Friedrich Hund, he proposed the Hund-Mulliken method, which describes electrons through mathematical functions delocalized over an entire molecule and which has since been expanded as the molecular orbital theory. 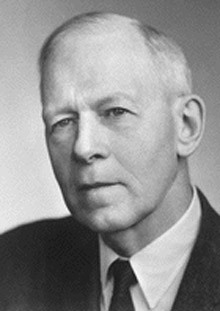 In 1934 he proposed the Mulliken scale, which calculates average ionization potential and electron affinity. During the First World War he worked under James B. Conant with the National Defense Research Committee and for the US Army's Chemical Warfare Service, designing and manufacturing toxic gasses. During the Second World War he conducted plutonium research at the University of Chicago, as part of the then-secret Manhattan Project to build atomic weapons. As computers came onto the scientific scene in the 1940s, he was always enthusiastic about the ways such machines could help science speed its advance. By the 1950s he was using computers to help in his calculations and in 1970, at the age of 74, he spent the summer working at IBM's laboratory in San Jose, where he learned to write computer programs. In 1986, his last year of life, he was among 74 living Nobel laureates who filed a "friend of the court" brief urging the US Supreme Court to strike down a Louisiana law requiring schools to teach "creation science" alongside the actual science of evolution.